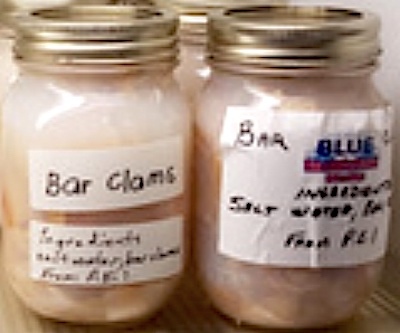 According to the CFIA, Out of the Blue Fish & Seafood Market has recalled certain batch/lots of Bottled Bar Clams from the Canadian marketplace because they may permit the growth of Clostridium botulinum, the bacteria that causes Botulism. Consequently, you should neither serve not consume the recalled Clam products identified above. ==> For information about Botulism, please consult the “Illnesses” tab on this site, located at the top of this page. If you believe you have purchased or have in your possession any of the recalled Bottled Bar Clams, please do not consume them directly nor use them as an ingredient in another dish or preparation. If you have any questions about this recall, please contact Out of the Blue Fish & Seafood Market at 1-519-565-4240 during normal business hours, Eastern Standard Time. ==> To see other recalls and notifications caused by contaminated, adulterated or mislabeled Bottled Bar Clams, please search for “clam” or more generically, “seafood” using the Search Box at the top of this page. ==> To see other recalls and notifications caused by suspected Clostridium botulinum contamination, please search for “Botulinum” using the Search Box at the top of this page. ==> To see other recalls and notifications for products manufactured, marketed and/or sold by Out of the Blue Fish & Seafood Market, please search for “Out of the Blue” using the Search Box at the top of this page.